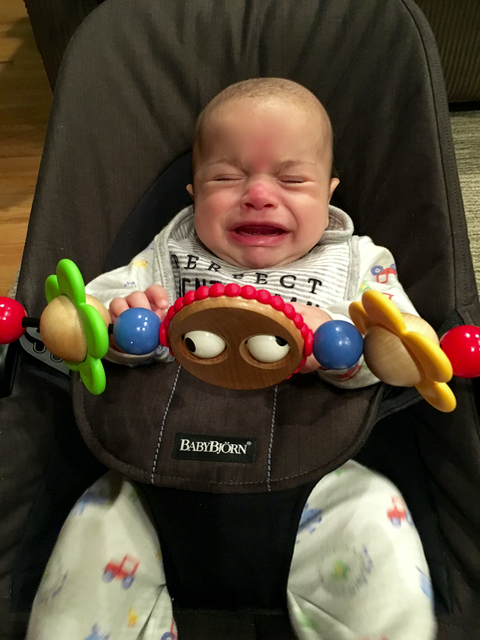 Love That Max : When do kids quit being crybabies? As a baby, Ben has a good excuse for crying. But I thought that as Max and Sabrina got older, they would quit crying over stuff. Usually daily, but at least several times weekly, one of them is crying over something. Sabrina will melt down if she doesn't want to go out with us to the grocery store or other places that do not have tween clothes. Or if Max is bugging her. Or that one time she didn't win the spelling bee. Max will cry when he doesn't feel like doing a therapy session because he's tired, or pretty much anytime he's sad. Ben is a lot easier to console: I feed him, burp him, change his diaper or rock him to sleep. I keep wondering when Max and Sabrina will quit being crybabies. Yes, Max is still coming along developmentally which may be partly to blame for his tendency to tear up but still, there's a lot of crying—with both kids. Saturday night, Max was very bummed. He'd gone to a Sabbath sleepover hosted by The Friendship Circle. The kids got to stay in a hotel, which is always Max's idea of a good time. Dave went to pick him up and called me, and I heard Max bawling in the background. "He doesn't want to leave," Dave said. "He wants to sleep at a hotel again!" Dave put him on the phone. "Hi, Fireman Max, did you have a great time?" I asked. "And you want to go to another hotel?" I knew they had arrived home when I heard crying at the back door. Max walked in, wailing. I have realized, by now, that saying things like "You are too old to cry over that!" does nothing. With Sabrina, I talk stuff through and she calms down. With Max, I employ distraction. This also can work with Ben, who will laugh through his tears when Sabrina makes a motion like she's drinking from a glass and says, "Glug, glug, glug!" How she figured this out, I don't know. It only works when she does it. "Welcome to Hotel Max!" I said. Max paused. "Fireman Max!" he said, sniveling. "OK, welcome to Hotel Fireman Max!" I said. He gave a little smile, but looked dubious. "I think you will enjoy staying at Hotel Fireman Max," I continued. "All of our rooms have views. We have a special room just for you, with a firefighter blanket and fire trucks." Now he was really smiling. "And we have a breakfast buffet, with chocolate yogurt!" I said. "OK, let's get your luggage up to your room." Then I shouted, "Bellboy!" and nobody came since Dave only responds to "Honey!" and dire threats to take out the garbage, but Max giggled. "OK, I shall take your luggage up to your room myself," I said. So I grabbed the Lightning McQueen suitcase and Max and I walked upstairs. I threw open the door. There were clothes all over the floor and his bed was unmade. "Housekeeping has not yet been to your room to clean up," I noted, "but you need to get to sleep anyway." Max agreed. So we got on PJ's. I said, "Room service is available, would you like a piece of cheese?" And he did, and I got him a slice presented on a fancy plate and he ate it. Once his teeth were brushed, the tears came again because Fireman Max had to make sure I was fully aware that he needed to go to a hotel. For two nights and three days, he informed me. "I promise, you will go to a hotel again!" I said, noncommitally. Oh, he was onto me. "Next week?" asked Fireman Max, hopefully. "No, not next week, but we will go," I promised. He lay his head down on his pillow, calm, and I felt relieved. I kissed him good night and returned to my regular evening duties as Head of Operations. You are such a wonderful mom. I'm going to remember this story the next time I want to yell at my kids to stop crying (which, as you say, doesn't work). Thank you but trust me, I am rarely this creative about distracting them! It's a temperamental thing. (I would peg Sabrina as SanMel and Max as either PhlegSan or SanPhleg.) Actually, I envy people who cry easily. As a choleric (ChlorSan or ChlorMel), I often feel like I want (no: NEED) to cry, but I can't. Anna, I could Google these terms but instead I'd love to hear you explain them, I always wonder. I am a developmental services worker student.As a part of my curriculum, i was following your blogs.It is very informative .there are many things we can learn from your blogs. You are a wonderful mom. Thank you so much, Stephy! Where are you in school? I've gotten some other comments from students, and I am so flattered that this blog is part of a curriculum. I cry-still and I'm 17. Mostly when I'm stressed or overwhelmed or anxious or just plain scared. I actually cry more than I did at Sabrina and Max's ages. But it seems like a lot of teenage girls end up crying when they are overwhelmed. Yes, I think that's very typical of teens. No worries Kathryn, I cried a lot in my teens, and I think many (most?) do. I cried even more in my early 20's, mostly because I wasn't getting much sleep at school. I don't cry nearly as much now, but it's not rare, either. Sometimes it's good just to be able to let it all out and move on.